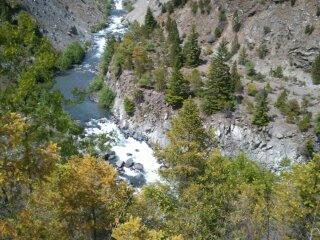 the way to the PGF site and Bluff Creek. 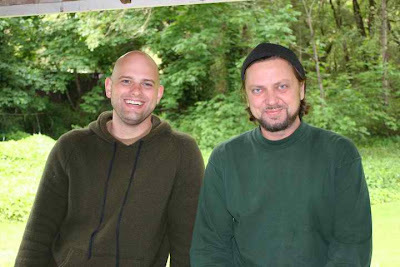 WITH GUEST BLOGGER TRAVIS McHENRY, and PHOTOGRAPHS IN PART FROM ROBERT LEITERMAN. Finally! We have time to blog! 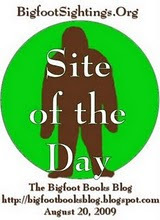 Y'all might check out our BIGFOOT BOOKS YOUTUBE page, where we've been wasting a lot of our blogging time (youtube.com/user/bigfootbooks). 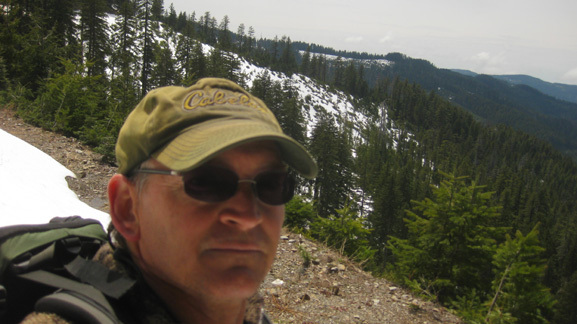 You'll find some cool things on there, like our Al Hodgson Interview, Rip Lyttle's 1990s Bigfoot Class, Talks from the recent Oregon Sasquatch Symposium, a walking tour through Bigfooty aspects of downtown Willow Creek, and much, much more. Check there under "Uploads" and "See All." View our entire Bluff Creek video series (45 in all so far) under "Favorites." 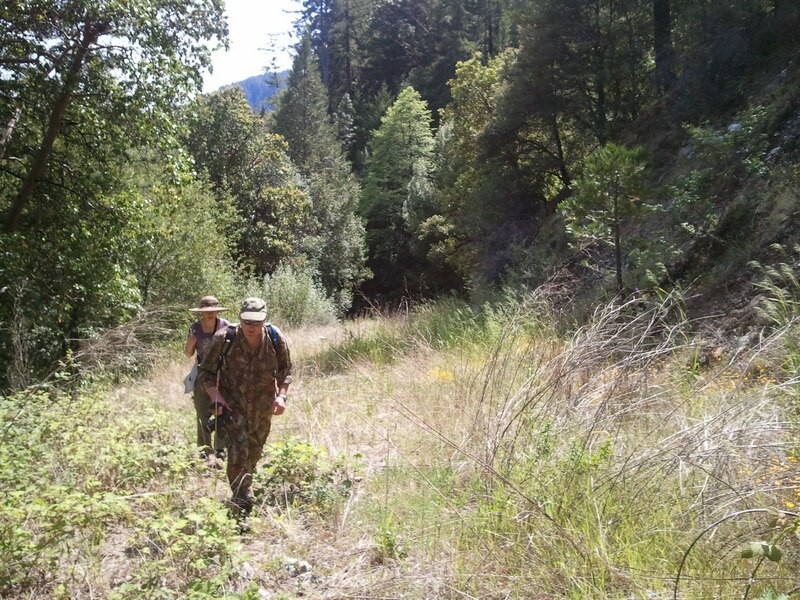 This is Part One of our initial attempts to get in to the Bluff Creek basin and continue our BLUFF CREEK FILM SITE PROJECT research from the work of last year. This entry covers our trip in very late May, and an update from a new friend, Travis McHenry, who found conditions up there quite similar to what we found (though he also found a possible Bigfoot track impression at Aikens Creek). 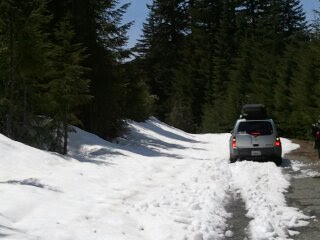 In an upcoming entry we'll cover our late June successful trip, wherein we found the snow had finally melted from off the roadbed on the passes, leaving just the maze of boulders and downed trees obstructing our way in there. On June 27th we finally made it again to the PGF site and Louse Camp. For now, here are the tales of our earlier attempts. 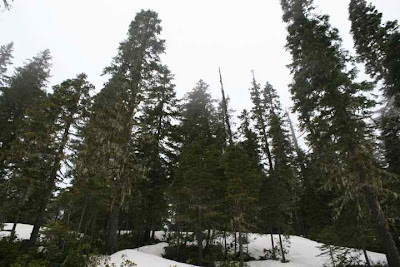 As Spring played coy and elusive here in Northern California, complete with full-on changes back into wintry weather, the snow pack remained stubbornly on the upper reaches of the Bluff Creek basin and its surrounding ridges. 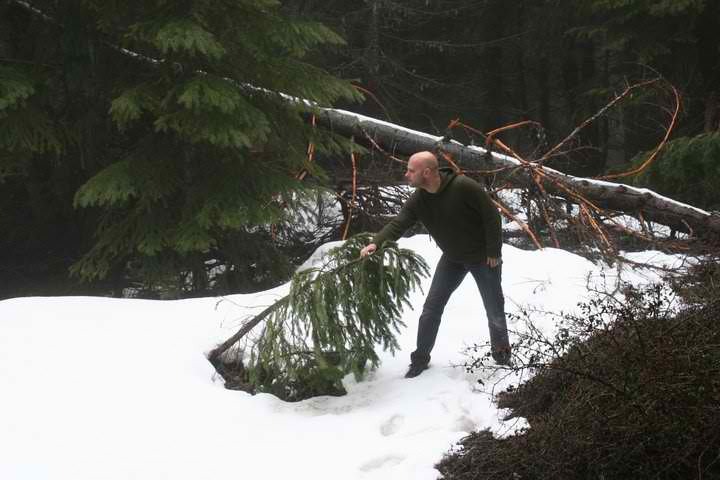 The Bluff Creek Film Site Project has been spinning its wheels, literally, in mud and snow, antsy to get back down in there, where the Patterson-Gimlin Film of Bigfoot was shot, so that we might finally continue our research. THE CURSE OF BLUFF CREEK, however, had other ideas for us. 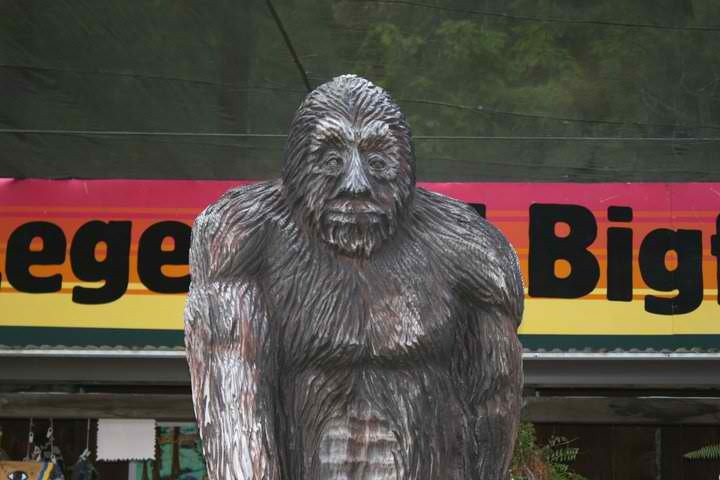 Bigfoot Weeps at the Folly. Personally, yours truly has now made four trips up there in the last couple of months (as of early June), only to find snow on the G-O Road, first at three miles, then ten miles, then thirteen, and finally fifteen miles up. 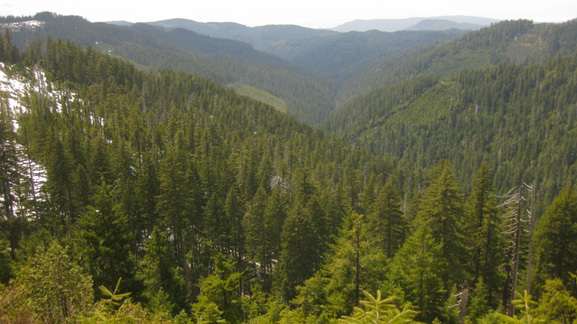 It is seventeen miles to the junction with Cedar Camp Road (FR 12N12), which leads down to the "Sasquatch Road" (12N13), which takes one down to the two routes where the PGF site may be accessed. 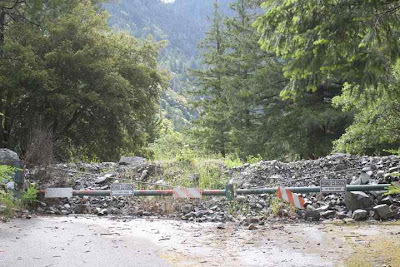 Given the wet, muddy and snowy conditions, however, the upper gate to the road leading down toward Louse Camp, as well as the lower gate to the south end of the Bluff Creek Road, remained closed for some time. This gate closure on the lower road at Hwy. 96 did not stop the guys from FINDBIGFOOT-FACEBOOK, however. On our last trip up there with the full Bluff Creek Film Site Project crew we saw those guys parked at the bottom of the Fish Lake Road in this vehicle that looked much larger than a Greyhound bus. They managed to get the gate opened by a ranger, and quite foolishly drove their gigantic RV monstrosity up the untried and winter-altered roads. Long-time Bigfooters will recall that it was just such an error that nearly brought researcher Daniel Perez to a fiery demise. Perez' motor home rolled into a rigid road rut, and was grooved right along to the edge and hurtled down the embankment on a ridge on the now-closed 12N10. The RV caught fire before Perez could rescue either his research materials, computer, or some warm clothes. He had to huddle by the mini-forest fire for warmth all night in shorts and a t-shirt, moving along as the fire progressed. You'd think FBF-FBK would have learned and "confirmed" on stupid before making the decision to attempt this trip. Factual errors abounded on this trip for them, too, including that they thought they were a mere few miles from the film site when they were about 20 miles away. They went up the southern end Bluff Creek Road and, it would seem, they stopped at the first closed gate some mere 10 miles in, and camped by the roadside. They also made a claim that no one can really get into the PGF site but for two months a year, though it can be accessed normal years from June to October. 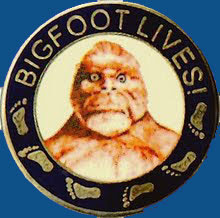 They also assumed that no one could have carried an ape suit in there to hoax a film, but it is well known that Patterson and Gimlin got in there with loaded packs and a packhorse (though not, we think, an ape suit). 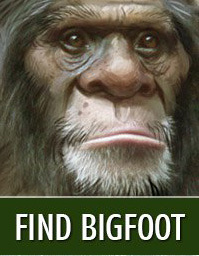 Oh well Bigfoot-Facebook, try again. 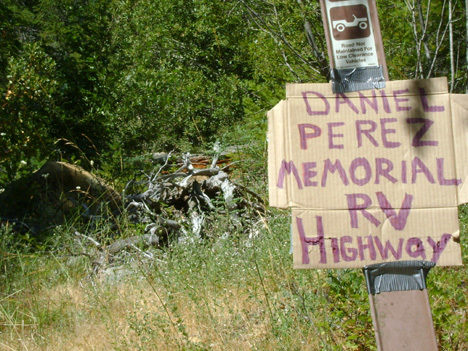 RV accident, this Bluff Creek road now bears this "official" memorial sign. 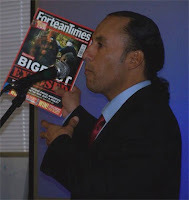 Proving again that if one is determined, and psychologically-prepped, to see Bigfoot everywhere, FBF-FBK, in the process of trying to make a DVD film with an Australian production crew indeed "confirmed" that even bears and hippie fire rings can be Bigfoot-related. 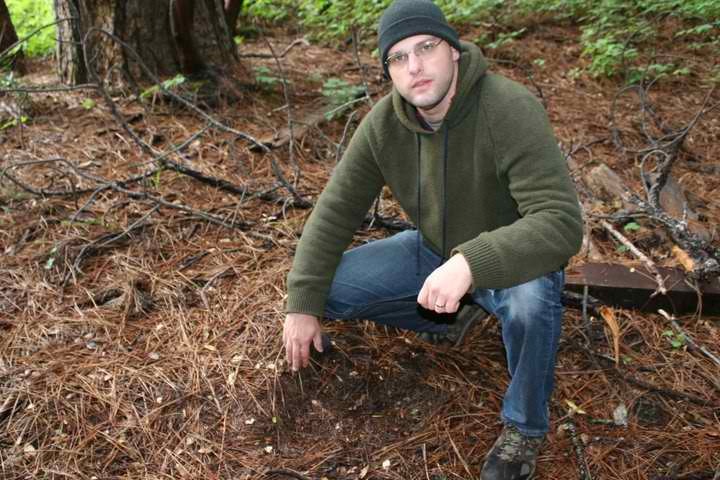 Assisted by the, um, "imaginative" Bigfooter, Freeman Young, from the north Bay Area, they indeed found a "ceremonial center" or "meeting place" of Bigfoot, along with "concentric stick structures." 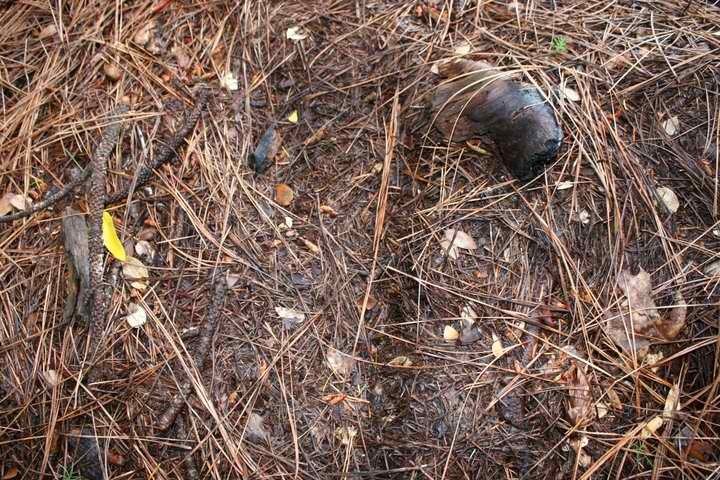 As evidenced by their postings, as well as the blog of one of their filmmaking collaborators, they mistook what were obvious human-constructed remains along the side of the road for some kind of mystical Bigfoot artifact. 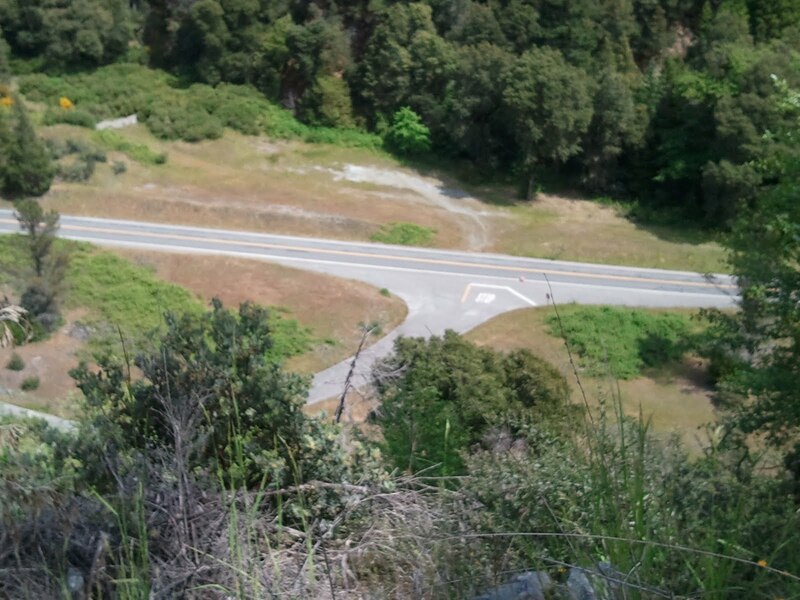 While driving up there they thought they saw a grizzly bear, even though those have been extinct in the state of California for nearly a century now. While eating spicy microwaved chicken wings in their RV they felt something scratching on the door and even shaking the vehicle. The assumption, of course, was that it was Bigfoot; but couldn't any one of them have thought that it might be that very same hungry black bear that they saw earlier? 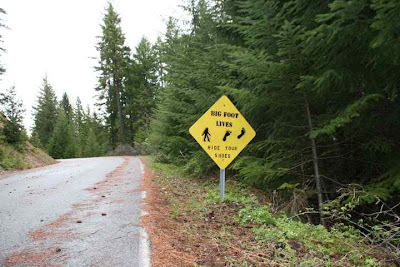 Or, maybe, they could have opened the door to say "Hi" to Bigfoot? Well, we'll have to wait until their DVD (or not) for the, um, ah, let us say, "startling," evidence. Twin Lakes in a tranquil moment. While we were up there at the same time we did not see a single sign of anything remotely Bigfoot-related. Despite, or rather, we should say, because of having a forest ranger, a graduated M.S.-holding zoologist (specializing in avian biology), a science teacher, and yours truly (whatever "I" am), we simply found the usual signs of nature and its animals in action. Yes, stick breaks and "formations" do occur due to winter weather's actions upon trees. 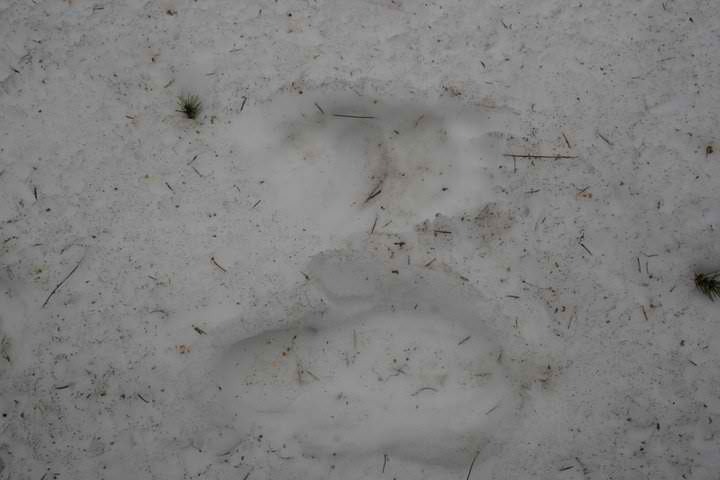 Yes, bears can and do make footprints that look "human," and large ones at that. Yes, owls can and do sound a bit like crazed apes in the night when they are having territorial battles. This latter we experienced while camping in the freezing cold up at Twin Lakes, just a few air miles away from the FBF-FBK crew. The war between a spotted and a barred owl for the prime lakeside turf started out owl-like enough at first, but by the second hour it really had escalated to the point where the untrained ear entering at that point might have heard crazed apes (Sasquatch) quarreling out in the woods. We, though, simply KNEW they were owls. It was undeniable. But with Squatch on the Brain, we suppose, anything is possible. Sigh. 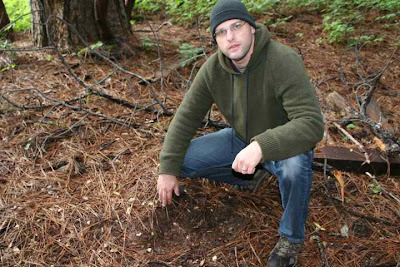 See the bottom of this blog entry for more details on how skewed and bizarre the Bluff Creek "findings" of these blobsquatchers. Here, then, are some photos from that trip. 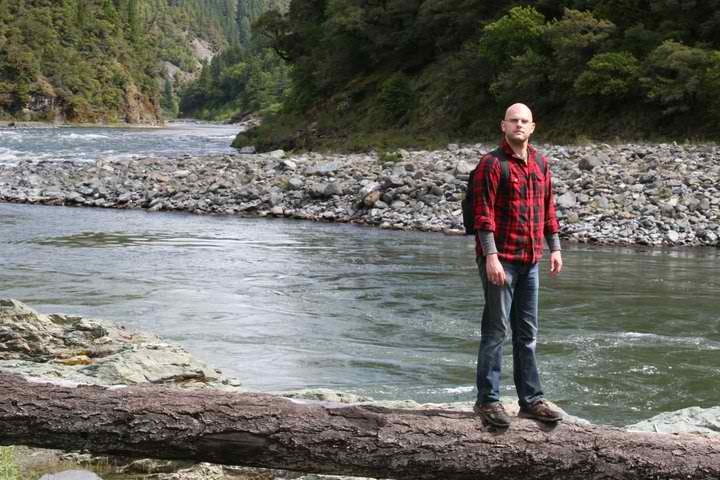 Stay tuned, below, for Travis' exciting trip and possible footprint find. 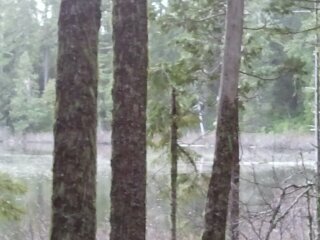 Twin Lakes, where the owls sound like wild ape-men. Bigfoot Creek, as seen from across the ridge above Twin Lakes near Cedar Camp. night vision monocular. Photo by S. Streufert. Dead End on the G-O Road, at mile marker 15. Getting 4WD squirelly. Intrepid adventurer, the rest of us heading to the warmer Klamath side. agony of defeat by snow, and the goofy camouflage garb. Mountain Wilderness. 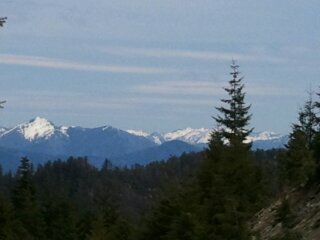 Eye level to snowline. Photo by S. Streufert. 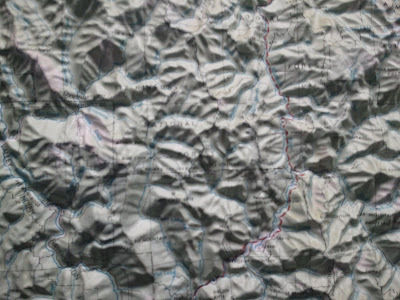 Textured topo map showing Bluff Creek and the PGF site. Photo by Steven Streufert Big, convoluted hills! After the Twin Lakes frozen night, which included some fun night-vision squatching night walks, the icicles awoke and headed up toward Cedar Camp. 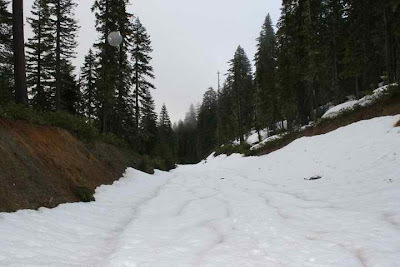 There was a large snow bank blocking the road just a few miles up from the lakes. We had to turn back and head north to try the G-O Road. 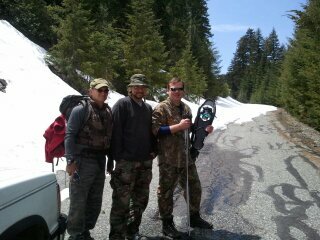 This, too, proved futile; but a brave Ranger Robert Leiterman continued on using snow shoes. 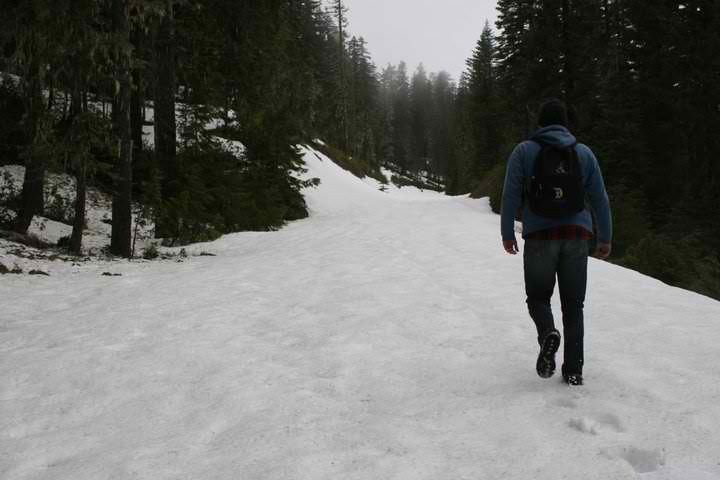 He found many bear tracks, and made it up to the ridge above the Bluff Creek basin. Here are a few of his pictures. 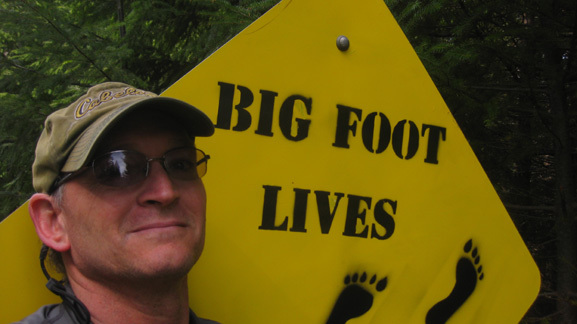 Robert with the G-O Road "official" Bigfoot Lives sign. 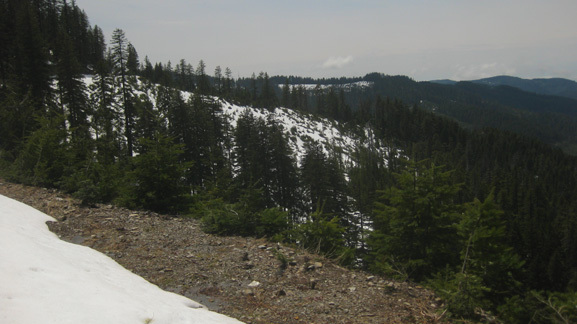 Late May to early June snow on the upper Bluff Creek ridge. The view down into the Bluff Creek basin to the west from 12N12. 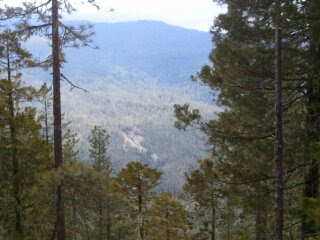 The PGF site is down in the far gulch past the clear cut in the left distance. Photos above courtesy of Robert Leiterman. 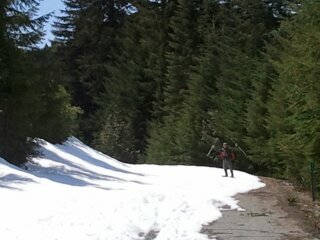 Here he is seen at the ridge above the Bluff Creek headwaters, on 12N12. The decommissioned old Bluff Creek Road, down near the Klamath bridge. Heading up the old Bluff Creek Road. Hot summer weather down here. great part by the 1964 flood, which destroyed the original bridge. Highway 96 seen from high above on the old Bluff Creek Road. 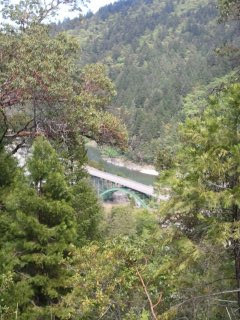 The Bluff Creek Bridge at the Klamath, seen from above. 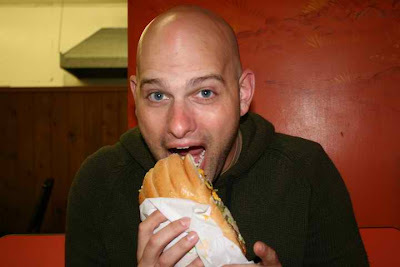 GUEST BLOGGER: Author, Thespian and Paranormalist, TRAVIS MCHENRY. 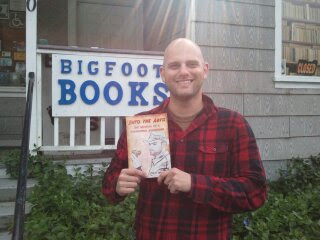 Travis McHenry with Steven Streufert at Bigfoot Books. Photos below courtesy of Travis and Cathryn McHenry. When I was planning my summer vacation six months ago in January, I had spent most of my winter break from college watching the last three seasons of X-Files on Netflix; and since I had already visited Area 51 and Roswell, I decided it was high time I made the trek eleven hours north to the Mecca of Sasquatchery: The Bluff Creek Film Site. Bigfoot aside, my wife Cathryn was eager for the opportunity to escape work and go camping for a few days, so we chose the first week in June as the date of our launch into the fabled land of Patterson and Gimlin. Travis poses with the Early Bird Restaurant Bigfoot mural. On May 30th, we had a long drive from visiting a friend in Carson City, Nevada, so our first night was spent camping at the Junction City campground about an hour east of Willow Creek. It was close enough to Bigfoot Country for my taste, and practically deserted, so we had the place to ourselves. Junction City campground is quiet, woodsy, and primitive—the perfect location for an encounter with mysterious wilderness beasts. 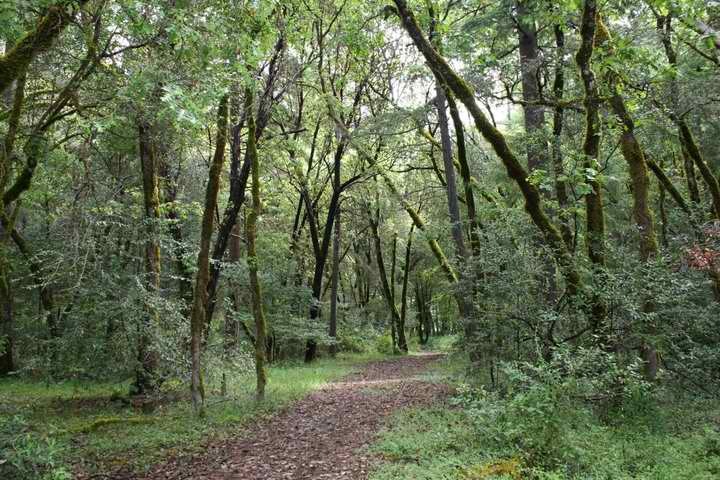 Unfortunately, it’s also overrun with poison-oak, so if you end up staying there, be careful and keep your legs covered! 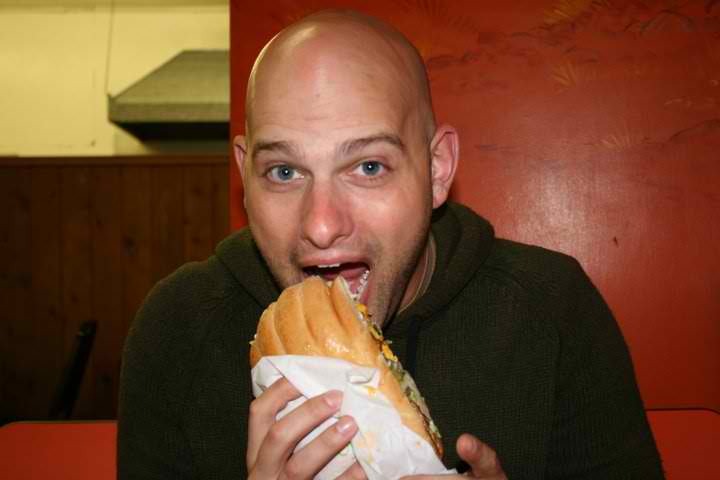 McHenry chows on a Bigfoot Burger in its foot-shaped bun. Halfway through the night, the rain that would plague the remainder of our expedition began falling hard against our tent, providing us with a noisy wake-up call. I was so tired from driving the previous day that I slept much longer than I anticipated and we didn’t break camp until around noon, when we drove onward to the humble hamlet of Willow Creek. 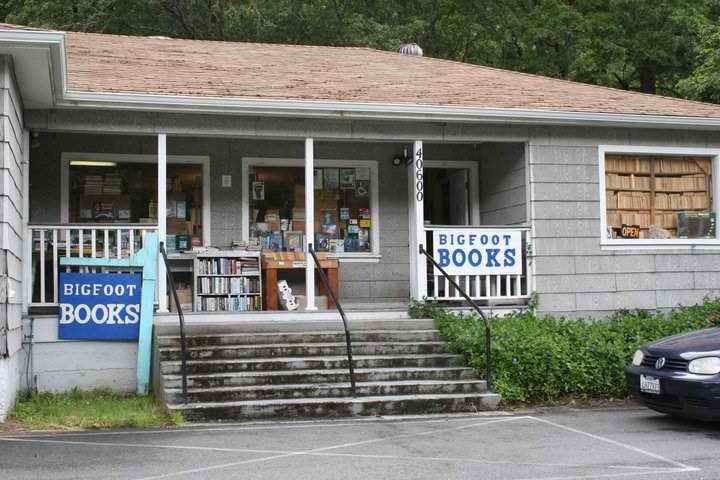 Taking a tip from fellow Bigfooter Eric Altman of the Pennsylvania Bigfoot Society, we decided to make Bigfoot Books our first stop in anticipation of getting some useful information and friendly conversation from the owner (and publisher of this blog) Steven Streufert. A large house-like building full of books to the rafters. 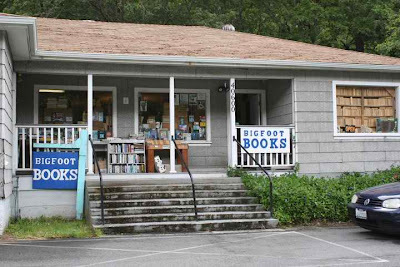 Bigfoot Books is what I imagine the houses of great writers looking like: stacks and stacks of all kinds of books everywhere, and hidden among all those stacks sits the lone author behind his computer monitor, hard at work pursing his passion. Steve provided everything an aspiring adventurer would need to get to the Patterson Film Site, and more! He’s a veritable treasure trove of Bigfoot lore, and he knows the local mountain backroads better than Patty herself. If you’re making a trip to the Willow Creek area, I highly suggest dropping by to say “hi” before heading out into the forest! 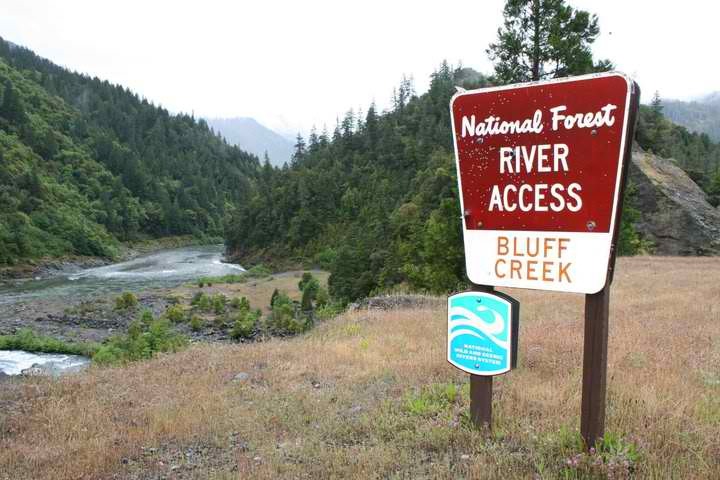 The shot-up Bluff Creek sign at the confluence with the Klamath River. On Steve’s advice we decided to travel up a little-used mountain road that wouldn’t get us close to the Film Site, but promised to have great views and a secluded spot to camp in an area with relatively recent Bigfoot activity. 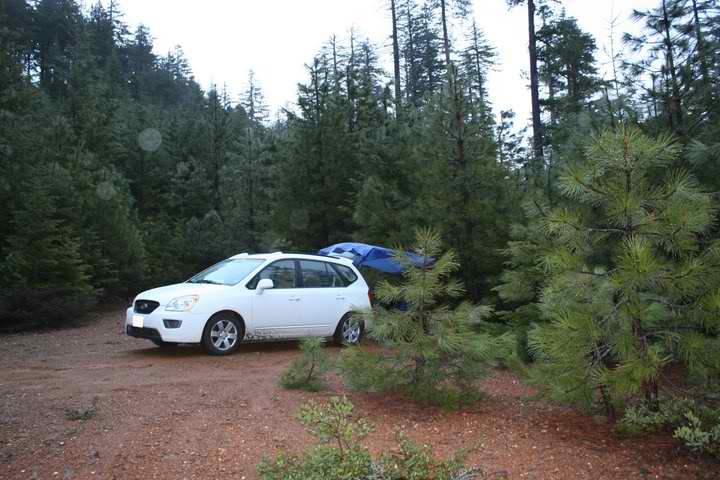 I should note that we were driving my wife’s 2008 Kia Rondo—not exactly a 4x4, and although the ol’ girl performed admirably throughout the tip, our ability to traverse the rough roads was somewhat limited, and we ended up doing quite a bit of hiking (which was part of the fun!). 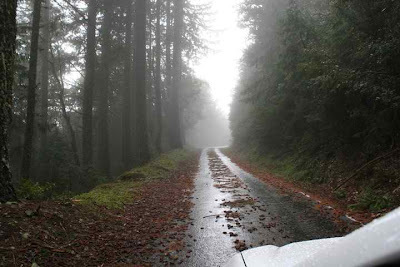 An enchanted drive up Slate Creek Road. We traveled on the unnamed mountain road [Slate Creek Road--it has a new sign] until the pavement ran out at around the 10 mile mark, when we decided to turn around and park the car so we could investigate on foot for a while. 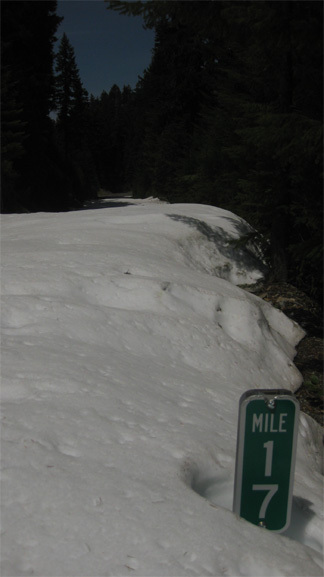 At that elevation, there was quite a bit of snow on the ground, but this particular road only had one small patch of very thick and icy snow near where we parked. Near the fork in the road, I spotted what looked like tracks in the snow about a hundred feet from the edge of the road; so I stumbled down an icy embankment into the snowy forest to investigate, but it turned out to be nothing more than some clumps of snow that had fallen off the trees and created four foot-shaped holes that looked larger than they were from the road. Back in the Kia, I stupidly tried to power through the patch of snow on the road instead of just driving through the existing wheel ruts. The car made it about five feet before becoming completely stuck. 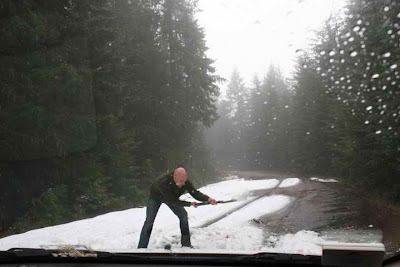 For the next fifteen minutes, I dug us out with an old army shovel while Cathryn took pictures from the comfort of the car. Ugh, I needed the exercise anyway. A typical Bluff Creek moment--digging out the car from the snow. At the 8 mile mark, we found a place to pull off the road and continued on foot for half a mile down a rocky, mudbog infested road to the beautiful, scenic campsite Steven had told us about. When we got there, however, we surprisingly found it already occupied by someone with a huge truck. Undeterred, we explored the surrounding area until it started getting dark and then headed back to the Kia where we decided to set up an improvised camp right there in the pull-off. This ended up being a colossal mistake that led to a fantastic payoff. Camp McHenry, high up on the Mountain. Camp McHenry (as we christened our makeshift car-camp) was fun at first, but as the sun descended further and further below the mountain, the temperature followed suit. By eleven thirty, it was truly frigid, and despite utilizing three sleeping bags, a heavy quilt, four layers of clothing, and being inside of the car, it was still way too cold for us to be remotely comfortable. We spent some time debating the merits of staying on the mountain for the rest of the night and decided the ability to use our toes as ice cubes didn’t sound like much fun; so we crawled for eight miles in the dark back down the twisty-turny road and pulled into the first campground we came across—which happened to be Aikens Creek. Aikens Creek Campground, main area. 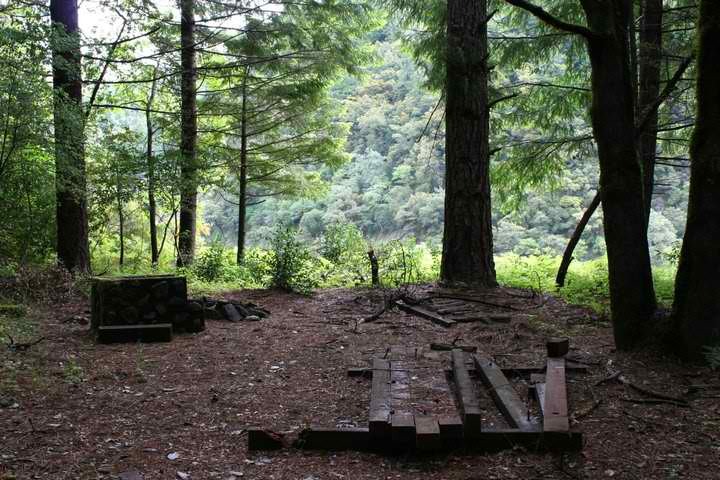 Aikens Creek campground is nestled snugly between Highway 96 and the Klamath River. There was only one tent there when we arrived sometime after midnight, so we chose a campsite at the far end of the camp in a grove of trees close to the creek. The temperature at the campground was incredibly mild compared to the subarctic cold we had experienced on the mountain. Too tired to set up the tent, we both fell asleep in our seats with only a single sleeping bag used as a blanket and no extra layers of garments. Abandoned area at Aiken's Creek Campground, one view. The hidden blessing of coming off the mountain was that we discovered Aikens Creek campground. In the morning, I woke up before Cathryn and did some exploring on my own. The creek itself is very clear and shallow and would be perfect for wading during a hot summer afternoon. Near our campsite there was a gate with a Road Closed sign barricaded by an unmovable pile of rocks. Not one to be deterred, I jumped the gate, climbed the rock pile, and found myself wandering through an old area of the camp that had been completely deserted and overgrown. 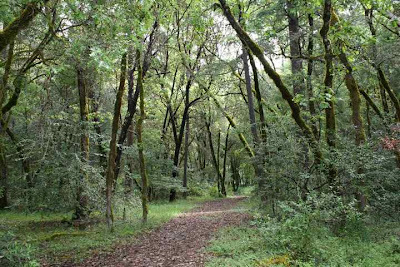 "Area at Aiken's Creek where I found a possible track." I love discovering hidden areas like this; I always call them “The Lost World” because I feel like I’m the first person venturing through in a thousand years. I wasn’t, of course. There were about twenty or so overgrown, moss-covered campsites and two very scary looking bathhouses that could’ve easily harbored a hockey mask wearing killer. At the end of the paved path through the abandoned campground, there was a steep rocky cliff that overlooked the Klamath River. As I stood admiring the view and enjoying the peaceful morning sunlight, I noticed a familiar depression on the soft ground a few feet from where I was standing. There was a nearly perfect “footprint” about 18-inches long about two inches into the dirt. There were a lot of pine needles on the ground, so the track didn’t have many discernable features, but I could make out what looked like impressions of individual toes. I eventually came back to the spot with Cathryn, and we took a bunch of pictures using a tube of chapstick for scale, but there wasn’t much contrast with the surrounding ground because of all the pine needles, so the pictures didn’t come out as clearly as I would have liked. There was a second “track” about six feet away going in the direction of the river, but that one wasn’t very clear. 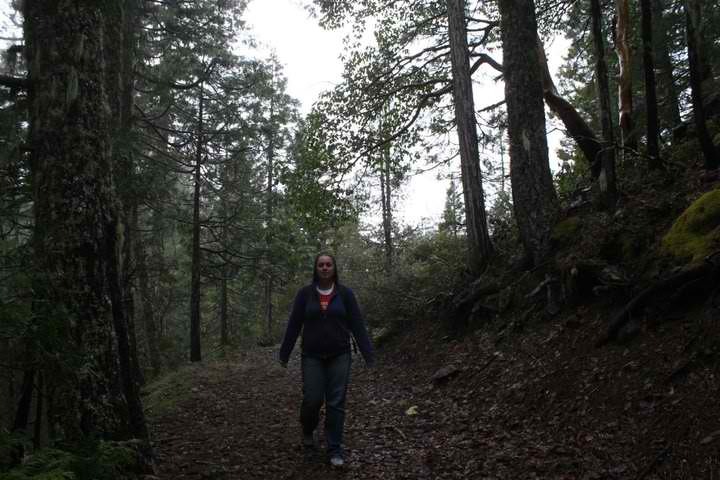 "Checking out the possible Bigfoot track." 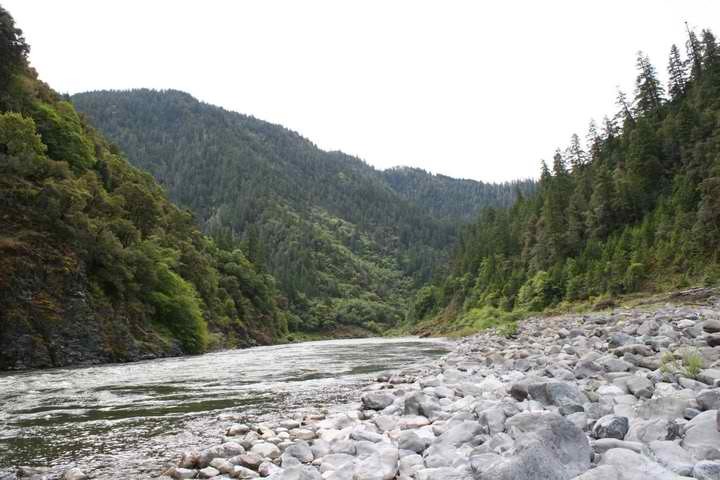 Once we were finished examining our find, we grabbed a can of fruit and some Pop-tarts from the car and made our way down to the rocky shore of the Klamath River via the access road running through the main campground. 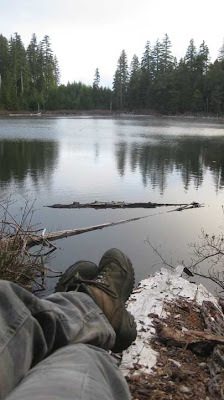 We enjoyed a serene breakfast while sitting on some large boulders in the field of rocks along the river and imagined that Bigfoot was watching us from high above in the surrounding cliffs. Back in Willow Creek, we tried to check out the Willow Creek-China Flat Bigfoot Museum, but there were so many people it was difficult to wander around without feeling like we were in their way. As it turns out, a production company from Los Angeles was filming a movie called “The Lost Coast Tapes” about an old codger who kills a Bigfoot and is trying to sell the body, but the whole thing turns out to be a hoax (sound familiar?). A member of the crew asked Cathryn and I if we wanted to be extras and make $60 each for one hour of work. Unbeknownst to them, I’m actually a professional actor from Los Angeles! Of course, we said “yes,” and were given roles as reporters at a press conference for the unveiling of the Bigfoot body. 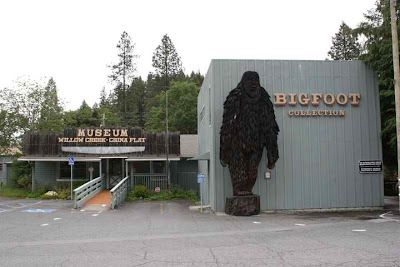 Willow Creek-China Flat Museum, with Bigfoot Collection wing. When the hoaxer failed to deliver the promised corpse, I shouted: “Where’s the body? Show us the body!” over and over in a tribute to “Where’s the beef” and “Show me the money.” The production company also interviewed me on camera concerning my own experiences with Bigfoot for the special features on the DVD. 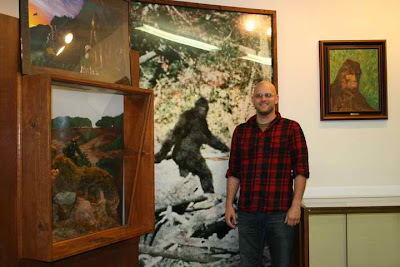 Hamming it up with Patty, inside the Bigfoot Collection. After we wrapped on shooting, we returned Bigfoot Books and hung out with Steve for a few more hours. We also picked up a Dean Koontz book, Paul Graves’ CD of Bigfoot songs, and some postcards for the folks back home. More importantly, Steve gave us detailed directions to the Patterson Film Site via the G.O. Road out of Orleans, but warned us that as little as a week ago it had been blocked by snow at the 15 mile mark. "Headed up the G-O Road toward the Patterson Film site." Using some of the money we made filming the movie, we paid for a hotel room at the Tsewenaldin Inn in Hoopa. We could’ve just as easily camped at Aikens Creek again, but (as Steve can probably attest) Cathryn and I were in desperate need of showers. At around 5:00pm, we decided to see how far we could get up the G.O. Road, which is completely paved and was very easy to drive in the Kia. As predicted, we hit a solid patch of snow at the 15 mile mark. Because of a misunderstanding, I thought we were only four miles away from the Patterson Film Site; and being so close to our goal, I wasn’t willing to give up so easily. We parked the car on the side of the road and began walking on the icy surface of the foot-deep snow that covered the road. The only signs of life we saw were the wheel ruts in the snow from Steve’s visit a week earlier, and a long line of bear tracks leading across the road. We examined the bear tracks for a while, remarking on how fresh and crisp they looked, then reminded ourselves that bears are generally nocturnal creatures before proceeding further up the G.O. Road. "Bear track on top, my track on bottom. 11 1/2 inches!!!" Three quarters of an uphill mile later, both of our shoes were totally soaked through from walking in the deep snowpack, and the sun was beginning its journey behind the mountains, so we stopped to consider the pointlessness (and improbability) of reaching the Patterson Film Site in the dark from our position—which was actually eight miles away over difficult, snow-covered terrain. If we had attempted to reach the site, which I thought was four miles away, I’m confident I wouldn't be here to write this. Pilgrimage toward the PGF Mecca. Wrong season though. While we were standing and talking, we both heard something rustling in the thicket behind us. 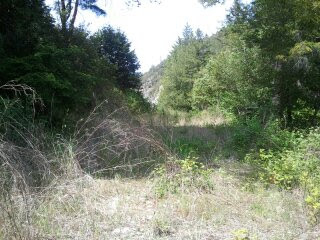 When I whipped around to see what it was, I saw the entire thicket moving and a slender pine tree behind the thicket get pushed aside as something scurried away from us and went down the mountainside. Cathryn and I both froze in our tracks and didn’t make a sound. After spending a few moments trying to process what had occurred, I made my way down into the thicket, but aside from some broken branches, I found no signs of recent occupation. There were no tracks in the vicinity, and no trace of anything having gone down the mountain. Whatever had moved through the area was gone. We considered it may have been falling snow, but there was no evidence of that, so I was forced to write it off as a tree-dwelling rodent that had somehow eluded our field of vision. "Toward the top of the GO Road. Almost to the Bluff Creek Film Site!" 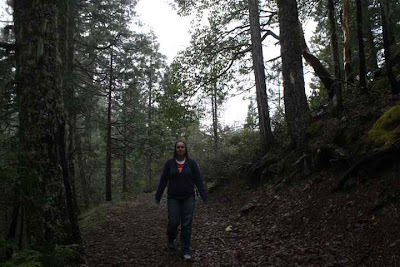 During the walk back to the car, we took a nice, leisurely two hour stroll and enjoyed exploring the surrounding forest until the sun went down. Living in southern California for the past three years has made me miss the trees of my native Pennsylvania, and being up there in Bigfoot Country conjured fond reminders of back home. After the trip up the G.O. Road was over, we realized that because of the foul weather, camping out wasn’t going to be much fun, and there was no chance of us reaching the Patterson Film Site until the snow melted; so we decided to pack up the Kia and after dropping by Bigfoot Books for one last farewell to Steve, we headed south to San Francisco to spend a day exploring the ghost hunting Mecca that is Alcatraz Island. Photo by that Streufert guy. THANKS, TRAVIS, FOR WRITING THIS! And to Cathryn McHenry, who took a number of the above photos. Ashland & Bluff Creek We spent Monday in Ashland, southern Oregon. After dropping by the location of Freeman’s first Bigfoot sighting, we continued through the farmlands and then up into the hills. One of the Aussie film crew following FindBigfoot-Facebook around describes their visit to the Bluff Creek area. Full of glaring errors, this is still an interesting travelogue, complete with "grizzly bear" sighting, a hungry bear bumping and scratching their RV dangerously placed on an old logging road, misconceptions about the film site location, claims that the Bluff Creek region has never been logged, etc. They were at the lower end of the creek, some 30 miles from the film site. There are no grizzly bears there, but lots of black bears that would love to shake an RV that smells like chicken wings. 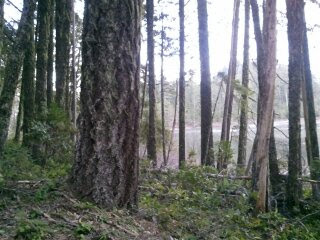 Also, the forest throughout has been extensively logged, leaving only small patches here and there of remnant old-growth. How far up the Bluff Creek-Fish Lake road did you guys get? We found snow blockages on the upper roads about 15 miles in, and we were up there the same days theywere, coincidentally. Too bad we didn't know you'd be there... we saw their gigantic RV parked at the road gate near the Bluff Creek Resort as we drove past. What can be learned from Bluff Creek? Getting back there in the off season is no easy task. Anyone that thinks that Patterson and Gimlin brought a gorilla suit on horseback in OCTOBER of '67 is completely delusional. Don't even waste your time dealing with them. Have them just try to get back there on 10 of '12 and then talk. Steven Streufert I was there at the film site when the National Geographic helicopter landed. They seemed quite peeved when we strolled up from the woods and told them we had just DRIVEN in there in an SUV without even using the 4WD. Plus, they were not even on the proper film site. Oh well, it made for good TV footage. It's easy to get there in October, unless it has been raining and snowing heavily. Up until last summer you could drive right down to the film site area. 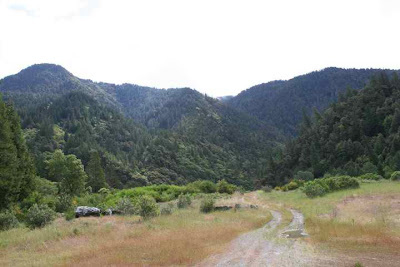 In 1967 it was a fairly easy horseback ride of just under three miles, going along a dirt logging road plow that had been utilized for post-1964 Flood salvage logging and hence maintained up to 1966. This argument holds no water; but still, Bob Heironimus' route description comes nowhere near the true filming site. He was never there, obviously. Bob Heironimus' route description will take one to Martin's Ferry Bridge, maybe Fish Lake, still some 25-35 miles from the Bluff Creek P-G film site. Now, who is the hoaxer? 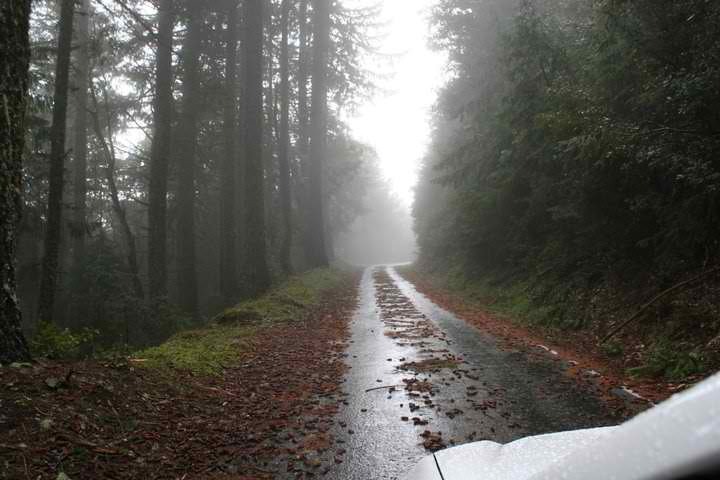 It's a drive over rugged dirt mountain roads, one that no one could possibly forget. It would have taken at least an hour, and then he would have had to go three miles up the creekbed from the nearest forest service road. It was nothing like the three miles, five miles easy drive that he describes, then or now. Bob H. is in a monkey suit, for sure, but not in the PGF. ‎@Mike Williams--if you had ever driven that route you would NEVER forget it. That terrain is not only quite dramatically beautiful, but you FEEL every mile of pothole-ridden, rain-riven, narrow, dusty, bumpy, boulder-strewn road, all while hanging on for your life much of the time as you proceed along near-vertical slope drop-offs to deep chasms below. 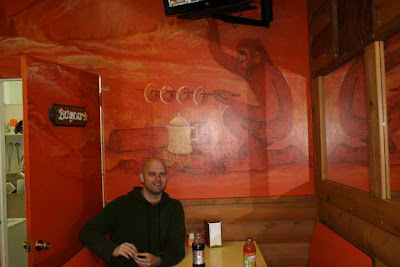 Bob H. describes a casual and easy, very short drive from his supposed meet-up with Patterson and Gimlin. His story is simply absurd in this regard. He was NEVER there, I repeat, NEVER was he at the real film site, a site that was located and verified with certainty after the filming. If he could forget that route he would probably also forget his own first and last names. Steven Streufert October in Bluff Creek is NOT the "off-season." It is generally warm and sunny in our area. It is often a very nice "Indian Summer" kind of weather during that month around here. It gets cold at night, and generally the rainy season starts at the very end of October, into November. Me say ha! me send bear and hippie to fool Facebook Bigfoot hunter. Me steal their hot spicy chicken wing. Me also lock gate so they no can get out of Bluff Creek. Me laugh so hard it make a blob on their camera and infrasound make white-out. What me say? Me no waste time make stick form like hippie on LSD do. Me no need that. Me already travel in other dimension.